Sometimes I’d like to tell every reader of Momma Zen, “Nevermind. I’m sorry. I had no idea what I was talking about. It’s not this simple.” Parenthood is the education of a lifetime, perhaps many lifetimes. Increasingly I find myself turning to the model of my mother and her tolerance, patience, and selflessness. My daughter keeps reminding me that there is a place to be involved in her life that is still present but not hovering, and not so self-righteously involved in who she is or what I want her to be. What I’ve seen is how emotionally dependent I’ve been on my daughter being happy, doing things that I like or liking the things that I do. The real shakeup for me has been seeing the degree to which I encumber my daughter with the job of feeding my ego or meeting my emotional needs. It is really a hard lesson to not exploit our children in that way, to not judge them, and to take an even further step back as they explore difficulty, pain and their own confusion about themselves. Whereas parents in our time feel so much stress and pressure to do something right and to advantage their children in some way, our children feel that times a hundred. My daughter said to me not long ago, “Mom, I have more stress in my life than you’ve ever had in your life.” And I’m beginning to see that it’s true: academic stress, social stress, physical stress. It’s hard. The lessons never stop! How can I write another book unless it’s an apology? I’m along for this ride and the ride is long and steep. I’m trying to keep my own place and love unconditionally again. This is what I said in a podcast recorded three years ago, which you can listen to in full at this link or via the player shown below. Although I scarcely knew it at the time, this has become the anthem of my life, my one true song. Love unconditionally again. The photo shown at the top is of kintsugi, the centuries-old Japanese art of fixing broken pottery with a lacquer of powdered gold, silver or platinum. Years ago after Hand Wash Cold came out, I traveled around to people’s homes and gave talks about the book. I called it my Kitchen Table Tour. Folks all over the country were kind enough to host me for a gathering of their friends and sometimes even let me, a complete stranger, spend the night. The miracle does not occur in the machine. The miracle does not occur in the second wash. The miracle occurs when I don’t say a word about it. Why couldn’t I just teach my husband how to load the dishwasher correctly? she asked, adding that she had two sons and she fully intended to raise them knowing the right way to load the dishwasher. I can understand that way of thinking. We want people to do things the right way, which is often our way, so they will be coequal to household tasks and other critical competencies. Why would we waste the opportunity to produce better, smarter people? It makes perfect sense, so I knew my answer wouldn’t satisfy her. Because I already know how to end a marriage, and I need to learn how to keep one. I think about this episode when I see someone write about what they are raising their children “to be.” Aren’t we all raising our children to be something better? You bet. It’s a fill-in-the-blank kind of thing. We might be trying to raise children to be kind, honest, self-reliant, or emotionally resilient. A loyal friend, a compassionate listener, a good citizen. Raising sons to respect women or raising daughters to respect themselves. We have all kinds of worthy ambitions for our children, I won’t deny that. But how do we teach that? By edict, insistence or imposition? I’d answered that question before too, in Momma Zen, and it might not be satisfying. My child will do what I do and say what I say, but she will never, without coercion, do what I say. The answer is that I have to be what needs to be. I have to be honest, self-reliant, and resilient. I have to be patient, tolerant, and optimistic. I have to be open and encouraging. A good listener and a devoted friend. Strong, brave, and self-respecting. I have to be that for her, even now, especially now that she’s gone. These days when she writes to me, which isn’t often, she says more or less the same thing: that I’ve shown her what a strong and intelligent woman looks like. Here’s how I would answer that. Not quite yet, but don’t give up on me, and I won’t give up on you. My daughter gave this to me for Christmas. She said I could write in it. I took it as a sign. Perhaps like me you go looking for signs. Not actual signs, which tell you exactly what to do, like No Parking On Wednesdays Between 12 and 3 p.m., but the kind of sign that you can read into. A sign that you should write that next book, for example. The book about how to be the mother of a teenager. 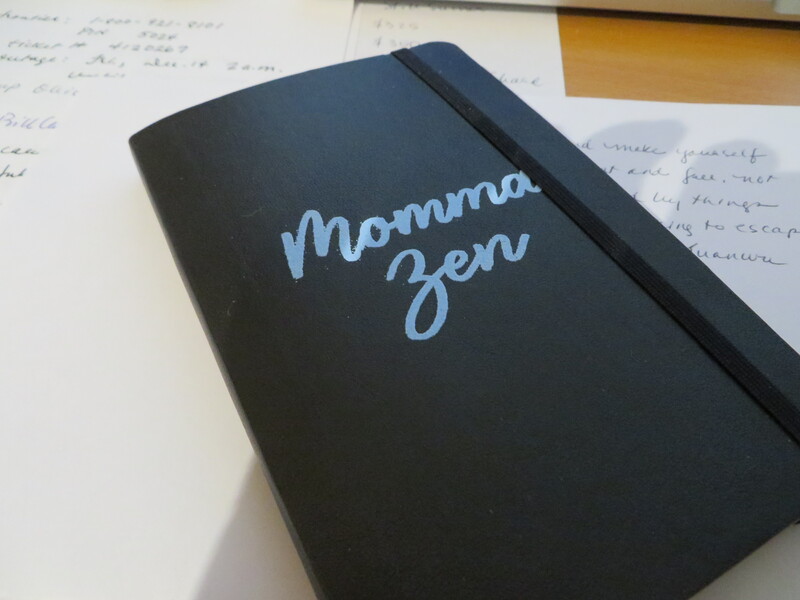 Shortly after Momma Zen was published a few people said I wish you would write about parenting a teenager! Yeah, right. I had a six-year-old. It was like asking me to write about the moons of Pluto. You take it on faith that the frozen rocks are floating way out there, but who cares? Later on, in the thick of age 14 or so, I knew what those parents had been asking for, but I couldn’t write about it until I’d stumbled out of the wilderness and into the clearing. The thing is, it’s a really big wilderness. Along the way, I marked a trail. The first thing I learned was that the teenage years start long before the teenage years. Like around age 9 or 10, when the sunshine dims and shadows creep. Soon, it became obvious that the only thing I could carry with me on the trip was love, extravagant love. And by love, I mean wide open space and silence. Trouble is, I was a slow learner. Stripped of the false sense of accomplishment, humility was my steady companion. Determined not to repeat my mistakes, I aimed to be just a tiny bit useful. To find the way, I’d have to listen, and more than listen, trust. Every step was a lesson in letting go. It’s scariest when you’ve gone just about as far as you can. But right about then, the light dawns. You’re back home, but it’s somewhere else entirely. There are five moons around Pluto. That’s one book I can’t begin to write. Even though it may not be necessary to write you a letter, I want to thank you again for everything you do for me. I am so incredibly lucky to have parents that support me in following my dreams, no matter how crazy they are. Even though I know I’m not always the easiest to put up with, you have always stood by me. I would not be the woman I am today without your unwavering love and support. You have shown me what a strong, intelligent, beautiful woman looks like. No matter how far away I am, I know you will always be a phone call away to help me if I am having a hard time, or comfort me when I’m feeling down, or just for me to tell you about my day. I hope one day to be as loving and supportive a mother as you are. I will always be your little snow bunny. I love you endlessly. Last weekend I got on a plane and paid close attention to the takeoff. The explosive roar as the engines throttled up. The rattle and shake as you accelerate down the runway. The bounce, the din, the doubt. The outcome of the whole endeavor doesn’t seem very promising at this point. Then, when you’re about to run out of runway, the lift of the wings overcomes gravity and the ride goes suddenly smooth. You’re wheels up, in flight. The day before, I’d walked into the house and my daughter calmly announced, “I cleaned my bedroom.” This is something I might ask her to do, oh, about nineteen times a day. Here she had done it without provocation, and was so quietly pleased that she wanted to show me. I stepped into a room devoid of any scrap of her school days. No pencils, pens, or spirals. No notes, no lists, no riot of papers. Counters empty, drawers organized, clutter disposed. In that moment I realized we’d cleared the runway. Today is her last day of high school. An on-time departure. You have always been you. It sounds a little bit silly to say that, because it doesn’t come close to expressing what I mean. As the person who has spent nearly every one of last 7,000 days and nights in silent wonder and raging worry over every aspect of your life—your eating, sleeping, feeling, and thinking; your hair, bones, blood and skin—I mean it as an admission. It wasn’t me. It isn’t me. It will not be me that makes you who you are. I have a memory of the first time you waved bye-bye. A sitter was holding you in her arms near the front door and I was walking out of it. When your baby waves bye-bye to you it’s a moment that really sticks. But it’s not quite right to say you were a baby then. You were already you when you did that, already a perfectly functioning human being. You were on a path that was uniquely yours, that had begun in a time and place before me, and that would progress in a completely intact and natural way after me. Why did I think I had so much to do with it? Every now and then my Zen teacher will say something (that he has said many times before) to point to the truth of life. It goes sort of like this: “Once you were a little child, then a teenager and now an adult. You were 10 then 18, 30 or 50. Was any of that hard to do?” No, we chuckle to ourselves, since it’s a given. It happens by itself. A lily does not become a stalk of corn either. It never becomes anything but itself, by itself. This is another revelation that sounds stupidly obvious and unremarkable. But we should reflect on it. We should study it: the obvious and effortless perfection of the way things are and how they come to be. I grew up in another time, a time before the dawn of the Industrial Parental Anxiety Complex. This is to say that my mother did the mothering, such as it was, and my father did the fathering, for better or worse, but nothing that they did or didn’t do was formed by this new attitude of expertise called parenting. Parenting is not something that anyone knows how to do or will know how to do. It cannot be taught, except by children, who have the sometimes charming and often infuriating ability to be no one but themselves. My mother never once hid broccoli in the mac and cheese. She never hounded me to practice the piano as a way to elevate my math scores or letter in lacrosse to polish my college prospects. These kind of manufactured agonies were simply beyond the few extra hours available in her day. She had other concerns, great matters, and her children did not appear to be chief among them. Oh happy day! Sitting quietly, doing nothing, spring comes and the grass grows by itself. This is not to say that we don’t have our hands full, as parents. Not to say that there isn’t much to learn or do, but it concerns our children far less than we think. Our job is to raise ourselves upright as half-decent people and self-managing adults. To be honest and reliable. To be patient. To have confidence in ourselves and trust in nearly everyone else. To keep going through the rough patches, with a resilient hope and idiotic optimism that all will be well. To shine light equally on the lilies and the thistles, the flowers and the thorns, the rocks and the mud and the grass that grows every which way in the field without applying a fence or force. To simply be, faithful and true, because that is how our children grow strong in themselves as themselves, lacking nothing, functioning perfectly, the amazing humans they already are. This morning I went into the backyard and took this photo of the Japanese maple, which is just now starting to change color. You might look at it and think, isn’t that lovely, and it is, but the color change used to take place in early November. The old calendar is obsolete. This is my daughter’s final semester of high school. In the fall, she will be moving to New York to start college. I don’t know any more than that. I don’t know what will happen then or after. It’s not my life. I might have pretended I wasn’t obsessed with the future for these last 18 years or so, but that was a lie. Before our children leave home we have a pretty clear idea of what we expect to happen the next day, week, month and year. We’re all in. But now the future has finally escaped my grasp, leaving my hands ready for—ready for what? A new year always brings with it the drive for change and renewal, but this one seems pointed straight at my keister. Everywhere I turn I see the message: What will you do with your days? What will you try now? What is it time for? How far will you go? My friend Mary Trunk has a new documentary project, Muscle Memory. A former dancer and choreographer, she reunited with her college dance buddies after 30 years and filmed them learning new dance steps while they talked about how they’d changed since their glory days. Were they still willing to take risks, create, and discover new things about themselves? I find the answers mesmerizing. Muscle Memory #1 from Mary Trunk on Vimeo. A few months ago my daughter asked me the very question lurking around these margins. “What will you do after I leave?” She beamed her electric smile at me, buzzing with her approaching freedom. I shrugged. “You could write a book about raising a teenage daughter!,” she said. She was trying to help, and she meant it. She was giving me her permission. It was a kick, a jump, a start. Let’s see how far I’m willing to take it. Maia Duerr has written a handy new book right up this alley, Work That Matters, a wise and realistic step-by-step guide to finding a livelihood that you love. If the questions on my mind are the questions on your mind, this book can start you off in the right direction. Leave a comment on this post for a chance to win a brand-new copy and a brand-new you. I saw a movie a few weeks ago, by myself, at a nearly empty Monday matinee. It is an acclaimed film, a coming-of-age story about a high school senior yearning to get out of a painfully outgrown home. It was funny, real, and poignant. And it was personal, because for me, the one who came of age in this story was not the impetuous high school senior who tosses herself quite literally from the nest, but her narrow-minded and critical mother, hardening herself against a future she cannot fathom and a departure she cannot prevent. Coming of age is not so much a coming, you see, it is a going. And then it is gone. I thought I knew what this would take, but the going only gets harder and the distance longer, the risks higher and the hurt deeper. As parents, we school ourselves on preparedness. We strive to protect. But in the end, your defenses get you nowhere, and what we really hope is that our children are headed for somewhere, somewhere, somewhere: a place without us, a place of courage and self-reliance, a life that is honest and original, not of our making, without the apron strings of approval or the aftertaste of unwelcome advice. Free. Another Monday not long ago, I sent my daughter a text during the middle of her school day after I’d cracked open the door to her bedroom and encountered the daily mound of strewn clothes, dirty dishes, shoes, towels, textbooks, and the ungodly mess of her inner sanctum. My terse words of blame and disappointment read: “Grow up!” Mustering the restraint that so often eludes me, she did not respond. And now I see why. Because the message is for me. The message is always for me. Perhaps you’ll join me on this path by listening to this new podcast interview. These days I could use a little company. The doors of the hotel ballroom opened and the wedding guests turned to see a tiny girl enter with a basket. She walked forward all by herself, dropping handfuls of petals with great seriousness until she stopped abruptly just halfway down the aisle. Then she tore out running the rest of the way to the front until she could hide herself on my lap. Her basket had emptied, you see, and she couldn’t keep going without petals to throw. It was precious, but for years after she would say that she ruined the wedding. I responded immediately as if she needed me to. But she didn’t need me that night, or any other. Over the weeks, her messages have been scant and short. They are petals, dropped on the far side of the aisle, from a full basket. This post was written seven years ago when my daughter had just turned 11, what I now recall as a particularly anxious year in the life of a girl and her mother. Truth is always true, though, so perhaps it is what you need today. Yesterday morning trying to pry my daughter out of bed and off to school was so completely awful, so terrifyingly bad, so angry, so loud, so confounding, that I thought: she needs a new teacher, she needs a new school, she needs a new attitude, a new diet, a new bedtime, a new mother, and short of that, an exorcism. I trembled with the weight of the disaster all day after. Something big would have to change, right away, and I had no idea what that could be. This morning was different. A radical change occurred overnight. It’s called “a new day.” I never know for sure exactly what my daughter needs, but when I’m at the end of my rope what I need is more rope. There are a lot of contrasting parenting styles and an endless supply of dos and don’ts. You’ll find a parenting expert of the day on the daily morning shows, and that expert isn’t me. Don’t get me wrong: every bit of information that comes your way can be helpful. If I have anything to offer it’s just my ever-renewed trust that our babies will be okay. If I have anything to give you it’s just more rope. I always invite people to stay in touch with me, to write me with their questions and concerns. Sometimes they do. They might ask about discipline, handling sibling rivalry, overcoming their own parental fears and anxieties, or how in the heck to get the kids dressed, fed and to sleep through the night. It might sound like I’m giving an answer, but what I’m giving is simply rope – the lifeline that keeps us bobbing aloft until the blessed rescue of a new day. Do you know who makes the day new? Only you.